Two Gummits along with two Spiky Gummits and a Golden Gummit. 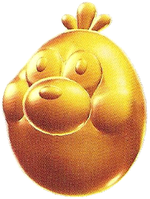 A Golden Gummit is a variant of Gummit appearing in Super Mario Galaxy 2. Much like the Gummit and the Spiky Gummit, they only appear in the missions The Chimp's Skating Challenge in the Freezy Flake Galaxy and The Chimp's Ultimate Skating Challenge in the Shiverburn Galaxy‎. They will give fifty points when defeated. French Patador From "or", which means gold. ↑ Browne, Catherine. Super Mario Galaxy 2 PRIMA Official Game Guide, page 191. This page was last edited on April 19, 2019, at 02:13.